Nian Gao or often called Chinese New Year cake (or tikoy for Filipino-Chinese friends) is made of glutinous rice flour that's popular during Chinese New Year because apparently it's homonym to "higher year" and thus brings good luck to the family. Another account say that Nian gao was used to bribe the Kitchen God who reports anyone who behaves badly to the Jade Emperor. How nian gao is cooked depends from region to region but the easiest I know is deep frying it dipped in eggs. 1. Crack and beat egg yolks in a bowl. A whole large-sized tikoy needs about 20 beaten egg yolks with albumen. For creamier preparations, use only the egg yolks, do not include the albumen (egg white); but you have to double the number of eggyolks. 2. Heat your pan with 1/4 cup cooking oil. 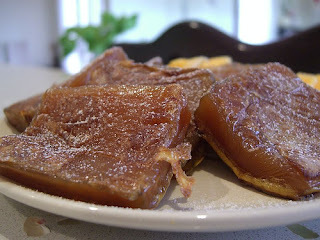 3. preferably beforehand, slice the nian gao into small 1 inch by 2 inches rectangles at about 1 centimeter thick. While doing this, start to heat your pan. 4. Dip the nian gao slices into your preparation of beaten egg yolks. 5. Place the nian gao one slice at a time in the pan if the oil temparature is already hot enough (usually medium to high). Do not put a nian gao slice on top of another. 6. Cook each batch by about 2 minutes each side or until the egg coating has turned golden brown and flip on the other side. 7. Take the nian gao from the pan and allow the oil to seep through a tough tissue before transferring to a serving plate. Chinese New Year cake is best eaten with great looking Chinese dresses!